Consumers who arrive at Apple's iTunes Store via the web-based iTunes Preview service will now notice a much slicker transition from their browser to iTunes, as Apple has done away with the old interstitial page in favor of a new in-place method. Rather than redirecting users to a separate web page when communicating with Apple's desktop apps —often a source of frustration thanks to its penchant for opening in a new tab or window —the iTunes Preview pane now rearranges itself to accommodate the notification. AppleInsider confirmed the change with apps from the iOS and Mac App Stores as well as media from the iTunes Store. 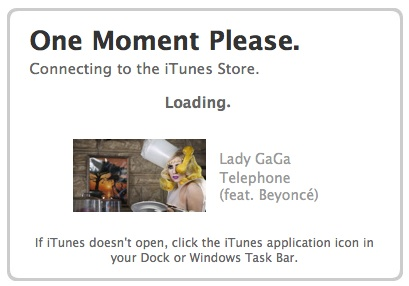 Apple has slightly altered the wording of the notice as well, no longer encouraging users to wait "one moment please." Apps are now "opened" rather than "connected to," and Windows users are directed to the iTunes icon on their desktop —rather than their task bar —in the event of a problem. iTunes Preview was first unveiled in late 2009, giving users a way to browse iTunes Store content without opening the desktop application. Apple then added song sampling and App Store access in 2010, but there have been few other changes in the interim. Apple has made a number of nip-and-tuck fixes to its ancillary web services in recent months, possibly as part of a campaign to tie up long-hanging loose ends in lieu of an all-out redesign under design czar Jony Ive. The company completely overhauled iOS's user interface last year and is in the midst of rolling out a similarly-scaled change to the next version of OS X, stretching design resources thin.